After catching some fresh mackerel for bait, the vessel is anchored up and a nice fresh bait is offered down tide to tempt one of the hardest fighting and most fun fish on light tackle to catch. Waiting for that clicking of the reels ratchet to start, synonymous with a scene from Jaws, as a powerful tope picks up the bait on its first blistering run stripping yards of line of the reel and that’s when the battle starts! 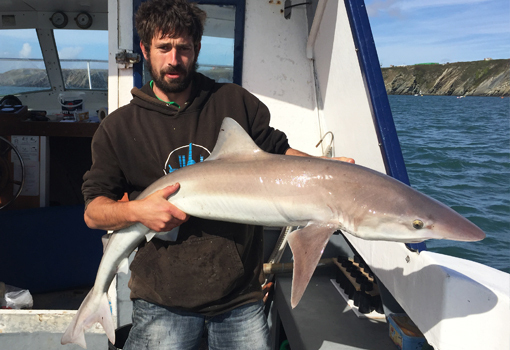 After what can take up to 20 minutes to get the tope alongside the vessel, they are carefully brought on board to be unhooked, measured, a quick photo and then released to fight another day. Tope hunt in packs so when the action starts it can come thick and fast. Fresh bait caught at beginning of trip or frozen provided.